FITBENCH Portable Fitness and Storage Solution – The FITBENCH is a new concept in group exercise equipment combining a functional workout station with a complete storage solution for included accessories. FITBENCH Functionality – FITBENCH includes everything needed in one small footprint to get you into great shape at home or in the studio. The polyurethane bench top provides a solid surface for performing dumbbell exercises typically performed on a weight bench. The integrated piston makes adjusting the bench to 8 different positions quick, easy and safe. The bench can also be used for plyometric box jumps which makes for a great cardio workout. 14 carefully positioned anchor points allow the attachment of included fit bands and optional battle rope for even more cardio conditioning options. Several storage solutions around the perimeter of the FITBENCH neatly stores the included kettlebells, rubber hex dumbbells and slam ball making them easily accessible at any point during your group workout. Your fit bands, optional heavy rope and even cell phone fit neatly tucked away inside. And since the FITBENCH offers wheels and handles, transporting it throughout the gym from one room to another is no problem. Have questions regarding the benefits of the FITBENCH or need a custom quote for multiple units? Contact an IRON COMPANY® equipment specialist today at 1-888-758-7527 or email quotes@ironcompany.com. (6) FITBANDS Premium Resistance Bands in individual sling bags. Removable handles allow bands to be stacked together to increase resistance up to 45 lbs. for exercises that use either the hands or feet. A nylon sleeve surrounds the band making it safe from snapping back at the user. (6) Dumbbell Pairs, Premium Virgin Rubber, Hexagon shaped – 5, 10, 15, 20, 25, 30 lbs. (2) Black Vinyl Dipped Kettlebells with smooth painted handle for superior movement – 20 lbs and 30 lbs. (1) Black Slam Ball – 15lbs. Unit Weight: Bench (empty) - 220 lbs. | Weights/Accessories - 275 lbs. Total Loaded Weight: 495 lbs. Weight Capacity: Rated to 2500 lbs. 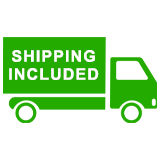 SHIPPING INCLUDED within the lower 48 states. LTL Freight – Ships assembled via LTL freight carrier in a wooden crate. All standard freight deliveries are curbside and include 24-hour notification and lift gate service. Additional services such as inside delivery are available upon request. A full inspection is required at delivery and notation on delivery bill of any missing or damaged product is mandatory for replacement. Online orders to non-direct points (Martha's Vineyard, Florida Keys, etc.) or outside of the lower 48 states will have additional freight charges emailed to customer within 24-hours and will be charged and shipped upon approval by customer. Shipping Weight (palletized): 554 lbs.